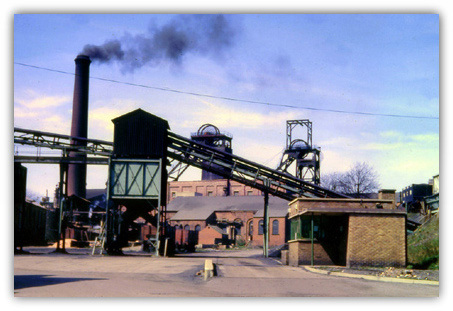 The output record at Ollerton (Nottinghamshire) was 42,000 tonnes for week ending 18th January 1992. In March the Chief Executive of PowerGen Ed Wallis made a visit to the colliery and went underground to see the working face. He said 10 million tonnes of Nottinghamshire coal was sold to PowerGen last year and 87% of Ollerton coal output went to their power stations at High Marnham, Cottam and Ratcliffe. Andy Stewart, Sherwood MP (Cons) had initiated the visit for PowerGen and National Power chiefs. 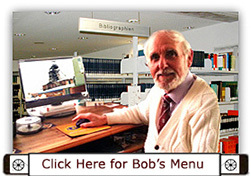 However he was replaced later by Paddy Tipping MP (Lab) in an election. Collieries closed in 1992: On 31st January 1992, Sherwood colliery (Nottinghamshire) situated in Mansfield Woodhouse and sunk in 1901-1903 by the Sherwood Colliery Co (founded by the Ellis family), was closed after 90 years, due to the ever-increasing problems of subsidence damage in the heavily built up area of Mansfield and spiralling costs. Shaft positions: SK56SW, No1 DC shaft 453709, 362480, No2 UC shaft 453708, 362450, 359 feet (109m) above sea level. Both shafts at 20 feet (6.1m) dia and sunk to 460 yards (420m) to the Dunsil horizon with 80 yards (74m) and 61 yards (56m) of tubbing respectively in the shafts were filled and capped. The base of the Permian measures at 252 feet (77m). A pit bottom inset was made at the Top Hard horizon. A reorganisation included installing a 400 tonne bunker at No1 pit bottom and skips in 1967 to replace tubs, along with a 100 tonnes capacity Hanmade moving bed type bunker in the Deep Hard seam. Ventilation was by 750hp Aerex Radial flow 98” (2.5m) double inlet fan giving 260,000 cu ft per min at 10” (0.25m) water gauge. 2 large diameter boreholes from the Deep Soft to assist ventilation to the lower seam were drilled in the 1980s. A pilot hole drilled by the Area Boring Team at about 9” (0.23m) dia from a fixed position at the top horizon to another position at the bottom, fixed by the Surveyor. A large diameter bit app 5 feet (1.5m) was attached and then hauled back up the hole with the bittings dropping onto a conveyor or off loaded from the floor by a machine until the large diameter bit reached the top horizon. Where the stratum was unstable the holes were lined. The system was similar as when creating the basis for a vertical bunker. Surveys were carried out using a dial to a magnetic meridian from theodolite bases and plotted by protractor on large brown holland backed roll plans prior to a re-correlation of the workings to the surface Ordnance Survey National Metric Grid carried out in August 1946 using a single wire down each of the two shafts. A semi-graphic resection was used to No1 shaft wire to establish the co-ordinate value and the bearing of No1 shaft wire to No2 shaft wire was established by observations to No2 shaft wire and the O.S. trig stations. New 2km x 1km flat sheet sectional plans for each seam were constructed in the late 1950s. In 1973 a Gyro theodolite was used during July on a base in the Deep Hard Main Intake roadway. In 1989 a survey was carried through the connection roadway onto a base in Mansfield Colliery Deep Hard/Piper workings. A difference of 01’ 06” in bearing and a difference in co-ordinate values of 0.32m in Eastings and 0.158m in Northings, representing a closing error of 1n 22,000, Levelling error between the 2 collieries was 2’ 2” (0.651m) representing a closing error of 1 in 12,000, both well within the limits of accuracy as laid down in the Surveying Code of Practice. The Sherwood shaft was measured in October 1948 using a 500 feet steel band. A further shaft measuring using a Wild D10 Electro Distance Measurer in August 1977 confirmed the value of the pit bottom bench mark within a couple of inches, a most satisfactory result. A drift connection had been made from Sherwood Dunsil workings to Shirebrook Top Hard. There was also a connection via a drift from Top Hard to Mansfield High Hazles in 1966 and the later Deep Hard/Piper 132s working at Sherwood was directly connected to Mansfield Deep Hard/Piper in 1987. Roof bolting was done at 130s salvage using an A/S base and a Fletcher machine, at NE No3 heading a Tamrock machine and 127sA face salvage a Boart BM8 machine. Short-wall retreat faces had been worked in the thick Deep Hard/Piper seam with pillars of coal left between. Also wide coal headings were started, in a pattern to partially extract coal from under the centre of Mansfield Town shopping area. However all these developments and sterilisation of the coal was high in costs and the subsidence costs outweighed them, so the pit had to be closed. Some years previously the Co-op Dairy on Southwell Road, Mansfield had been demolished due to severe subsidence damage from a panel from Mansfield colliery. Yard seam 3 feet 1 inch (0.93m), was developed by drifting down from Deep Hard roadways and 5 longwall advancing faces were worked 1978- Jan 1992 at 2,307 feet (703m) and Blackshale 3 feet (0.91m), developed by 2 drifts dipping at 1in5 from Yard seam roadways in 1982 but only 3 panels were worked 1984-1992 at 2,371 feet (722.5m). 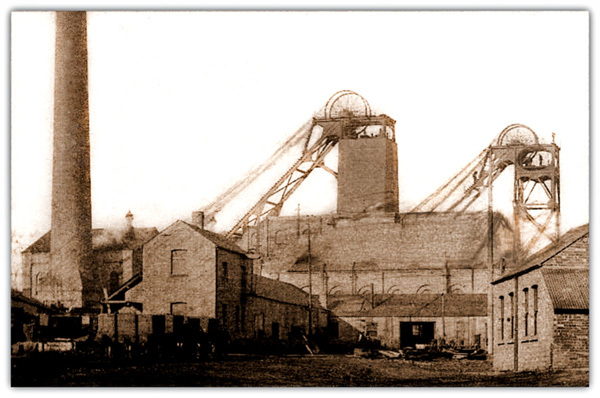 The lowest point in the Blackshale seam being the deepest at the pit was 711 yards (650m) below the surface. A further area was developed by 2 drifts dipping at 1in6 from Yard seam roadways in 1991 but only one panel was worked due to the colliery being closed. Exploratory headings had also been made in the Main Bright 3 feet (0.91m) 1933 Aug 1934 at 868 feet (264.5m) from insets in the shaft, High Hazel 3 feet 7in (1.09m) Dec 1938 at 1,043 feet (318m) and Abdy Apr 1943, 3 feet 2 in (1.08m) at 929 feet (283m). The Clowne (Main Hard) seam commenced during 1946 from the shaft inset roadways but was discontinued and abandoned before opening a face in Mar 1947, 2 feet 8 in (0.81m) at 782 feet (238m). A new pit bottom was made at this horizon. A panel in the Abdy seam was opened 1939 from drifts from the Main Bright roadways but was stood from June 1939, re-opened 1942, finished Sep 1943. Headings up from Top Hard to High Hazel (or High Hazles) to West. Heads up again to Main Bright, panel opened to East Dec 1933-Aug 1934, slow advance. A connection was made to Mansfield Colliery High Hazles to provide an emergency exit. Methane drainage was practised in Deep Hard/Piper, Yard and Blackshale seams by inclined boreholes up and over the goaf in the supply gates. Pipe ranges connected to the holes pumped the gas to a discharge point where the the gas was exhausted safely into the general body of the return air. Water underground was only of nuisance value, in the region of 0.5 million gallons per annum in 1986, then averaging 2 million gallons a year from 1988 pumped out of the mine, but increased rapidly to 6 million gallons in 1990 and 8 million gallons in 1991 due to dewatering old Yard seam workings to allow undermining to proceed. 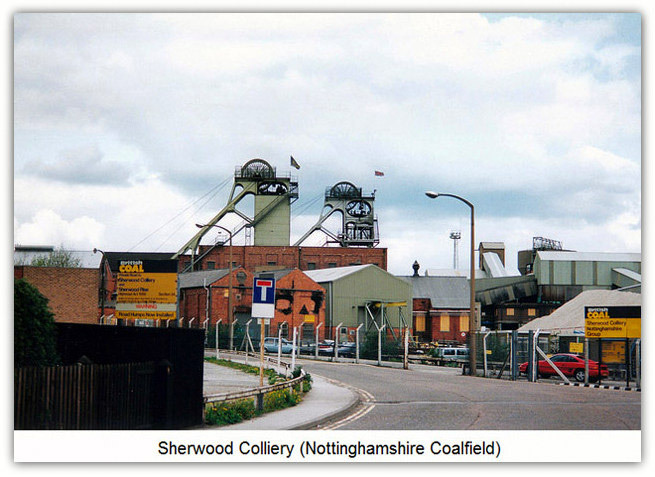 Sherwood Colliery Company also had a thriving brickworks. The bricks, made out of fireclay bind extracted from above the seam were some of the best in the land and were renowned for their use in house building, particularly locally, and for use in all the local pits not having their own brickworks, but due to their very hard nature were difficult to break, being not unlike blue bricks. In the pits in the past, all the pit bottoms and many of the major junctions would be constructed of brick so companies with brick kilns always had a ready market for bricks that were ‘spare’ after own use.